In medium bowl, stir pumpkin, Bisquick mix, sugar, milk, butter, 1 1/2 teaspoons pumpkin pie spice, the vanilla and eggs until blended. Stir in chopped pecans. Pour into pie plate. Bake 35 to 40 minutes or until knife inserted in center comes out clean. Cool completely, about 1 hour. Stir whipped topping and 1/4 teaspoon pumpkin pie spice. Garnish pie with topping and pecan halves. Store covered in refrigerator. No pumpkin pie spice? For the pie, use 3/4 teaspoon ground cinnamon, 1/2 teaspoon ground ginger, 1/8 teaspoon ground allspice and 1/8 teaspoon ground nutmeg. For the garnish, sprinkle cinnamon over the whipped topping. What’s better than pumpkin or pecan pie? Pumpkin and pecan pie! 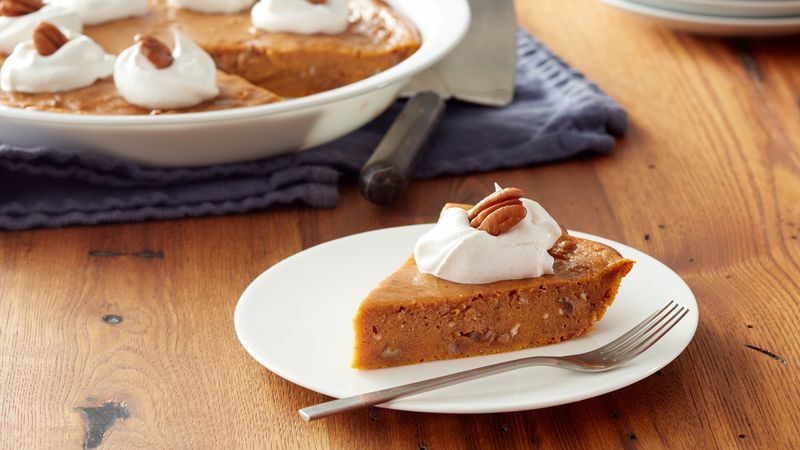 In this pumpkin-pecan pie you get the creamy custard of a pumpkin pie, studded with crunchy pecans. We love using canned pumpkin, rather than pumpkin pie mix, which is one way we can control the flavor and sweetness level of the pumpkin filling. This pie is crustless, but if you’re looking for a more traditional pumpkin or pecan pie, you can start with our tips on how to make pie crust from scratch. This pumpkin-pecan pie is easy enough for a weeknight, but special enough to serve for a fall or winter gathering.